I found this really cool article about What Your Pediatrician Wishes You Knew. My only beef with the article is that there are supposed to be at least one more page. Its missing. Still, some good stuff in there! Are you here because you're an Attachment Parent, too? How about Attachment Marriage-ing? Very interesting take on... attachment principles. Check out these Dream Bedrooms! There is one especially for Amanda Metro! Which one is your dream bedroom? Sasha asleep in our bed. I am seriously NOT a schedule-keeper with my kids (except while my older daughter is attending a school or other scheduled function). I've had a lot of trouble lately with Sasha staying up insanely late, but it goes back to why... I think it is because of a drastic dip in milk supply. She's simply having a hard time learning to go to sleep without warm milk in her tummy. I've been advised to adhere to a strict schedule with a regular routine. Um... that's just not my style. I absolutely love what living peacefully with children has to say about sleep patterns vs schedules. All that said, Natural Parents Network recently published What to Expect When You’re Expecting . 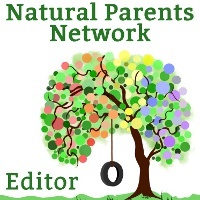 . . for Natural Parents. Awesome list! I seriously need to make this toothpaste! Its a Homemade Vanilla Kids Toothpaste Recipe (there is also orange)! I can't find any more vanilla toothpaste in the store. This one comes from one of my newest followers! I'm going to leave the list at that for now. I have more to share, so tune in again next week! What recipes for household cleaners have you found that you love? Yes! I'd love to sleep with sharks! If not chemicals, then what? Playful Parenting = Extra Energy?? Why Treat Lice without Chemicals? Wordless Wednesday: Happy Birthday Dad!